Have the bears finally won back control? I’m sure I’m not the only one who would have liked 2018 results to have been as of November 30th (or even better, October 1st). My stock forecasts were looking a lot better on those dates (and if I were smarter, perhaps I would have taken some of the gains at that point). My average gain was over 34% on October 1st (versus the S&P being up 8.5%) and was still holding at +10% as of November 30th with the S&P ahead 2.4%. Unfortunately, the year includes a disastrous December and my 4 stock picks ended the year at a 6.6% average loss. Since stock picks are always relative to the market, I take some solace in minutely beating the performance of the S&P which was down 7.0% for the year, especially since I favor very high beta stocks. Before reviewing each of my picks from last year, I would like to provide a longer term view of my performance as it has now been 5 years that I’ve published my blog’s stock picks. 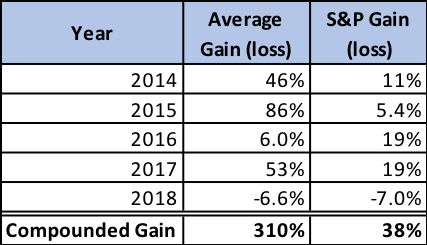 Even with a down year in 2018 my compound gain is 310% versus an S&P gain of 38% over the same period. This translates to an average annual gain of 25% per year which coincidently is the target I set in my book (published years ago and now out of print). Unlike last year, I certainly cannot take a victory lap for my 10 forecasts as I missed on 3 of the 10 and barely beat the S&P for my average among my 4 stock picks (all of which will be included again in my 2019 top ten). I’ve listed in bold each of my 2018 stock picks and trend forecasts below and give a personal, and only modestly biased, evaluation of how I fared on each. Tesla had an extraordinary Q3, 2018 as the model 3 launch showed how potent a player the company is becoming. In the quarter the Model 3 was the best selling car in the U.S. in terms of revenue and 5th highest by volume. This drove a greater than 100% revenue increase versus a year earlier and $1.75 in earnings per share versus a loss of $4.22 in the prior quarter. Given that the starting price for a model 3 was at $49,000, it is rather amazing that it could generate that volume of sales. Since the backlog for the Model 3 appears to remain at well over 300,000 cars and Tesla is closing in on a launch in Europe, Tesla seems assured of continued strong revenue through 2019 and likely beyond. However, much of the backlog is awaiting the lower priced (sub $40,000) version of the car which I believe will be available in Q2, 2019. As I had predicted, the Model 3 ramp up in production volume led to improved gross margins which exceeded 20% in the quarter. Despite the down market, Tesla stock was up about 7% in 2018. While we will continue recommending the stock, the phaseout of tax credits for buying an electric car has already begun. In its Q3 update Tesla stated that “better than expected Model 3 cost reductions is allowing us to bring more affordable options to the market sooner.” Yet, despite this forecast, the recently announced price decreases drove the stock down. Facebook stock appreciation will continue to outpace the market (it opened the year at $182/share). Facebook stock did not perform well in 2018, closing the year down 28%, making this pick a losing proposition last year. This comes despite revenue growth that should be between 35% and 40%, and net income that is tracking towards about 35% growth (despite a massive increase in SG&A to spur future results). What impacted the stock heavily was the plethora of criticism regarding privacy of user information coupled with the continuing charges of Russian usage to impact the election. Before the wave after wave of negative publicity the stock had reached a new high of $218/share in July. Because of the need to improve its reputation, Facebook is likely to continue to increase its spending to address privacy issues and to burnish its image. In summary, the fundamentals of the company remained quite sound in 2018 but the barrage of issues torpedoed the stock. Amazon stock appreciation will outpace the market (it opened the year at $1188/share). While its stock dropped considerably from its September high of $2050, Amazon remained one of the best market performers in 2018 closing the year at over $1500/share. The company continued to execute well, growing every part of its business. It also began to leverage its scale as net income grew considerably faster than revenue and is likely to be well over triple that of 2017. Growth should be lower in Q4 2018 than earlier in the year as Q4 2017 was the first quarter that included all revenue from the acquisition of Whole Foods. Since the analyst consensus forecast already reflects Whole Foods revenue being in Q4 last year, as well as concerns over Amazon maintaining strong performance in Q4, I would not be surprised if Amazon was able to beat expectations in Q4. Stitch Fix stock appreciation will outpace the market (it opened the year at $25/share). In my forecast I stated that this was my riskiest pick and it certainly proved the most volatile (which is saying a lot given the turbulence experience by Facebook, Tesla, and Amazon). I was feeling pretty smug when the stock reached a high of $52/share in September with a little over 3 months left in the year! Obviously, I was less sanguine as it dropped precipitously from September’s high to a low point of $17.09 by year’s end. I’m hoping that those of you who followed my advice trimmed back when the stock soared (I confess that I didn’t). The company continued to balance growth and profitability throughout the calendar year with October quarter revenue (up 24%) and earnings ($10.7 million up from $1.3 million in the prior year) both beating analyst expectations. Yet, concerns over user growth severely impacted the stock. I’m somewhat surprised by this as the users grew 22% and revenue 24% – since revenue beat expectations this means that analysts did not forecast an increase in average revenue per user. But the bottom line is, despite solid fundamentals the stock did not perform well. The stock market will rise in 2018 (the S&P opened the year at 2,696 on January 2). When I made this forecast, I pointed out that I’m not particularly good at forecasting the overall market. My belief was based on the fact that the tax cut for corporations would mean a rise in earnings that exceeded the norm. I felt stronger earnings growth would be enough to offset the risk of the longest bull market in history turning negative. I sited the likelihood of higher interest rates being an additional risk. 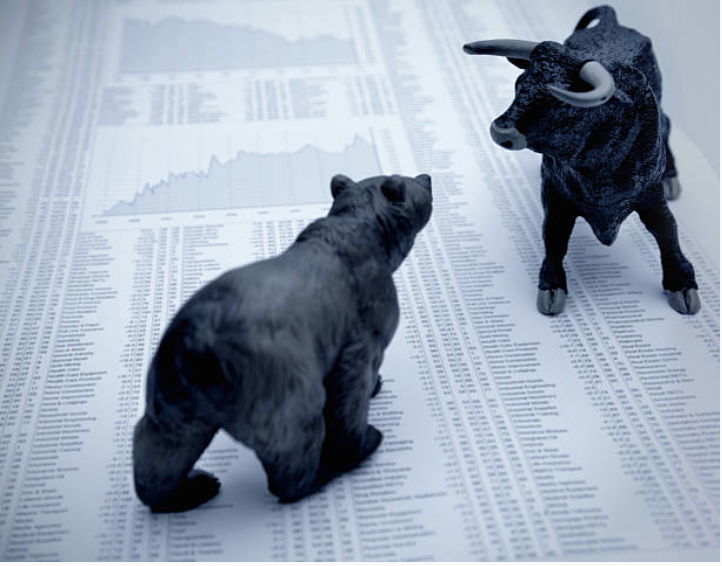 The market almost made it through the year as it was still up heading into December, but the combination of 4 interest rate hikes in the year coupled with considerable criticism of President Trumps behavior was just too much for the market by December. I view this as a partial victory as I had all the fundamentals right and came within less than a month of being right for the year when many felt the bears would gain control in early 2018. Battles between the federal government and states will continue over marijuana use but the cannabis industry will emerge as one to invest in. During the year the legalization of marijuana for recreational use continued to increase on a state by state basis with the number increasing from 6 at the start of the year to 10 by years end. Use of medical marijuana is now legal in 33 states. Several other states, while not formally legalizing it have lowered restrictions on individual use. The industry remains at a very early stage, but numerous companies are now public, and the recent market correction has the shares of most of these at more reasonable levels. While I would urge great care in stock selection, it appears that the industry has emerged as one to consider investing in. At least one city will announce a new approach to urban transport. In this prediction I cited the likelihood that at least one city would commit to testing a system of small footprint automated cars on a dedicated route (as discussed in our post on December 14, 2017) as this appears to be a more cost effective solution than rail, bus, Uber, etc. Kyoto has now announced that it signed an agreement to test the system offered by Wayfarer and the company is now out of stealth mode. Wayfarer expects to provide substantial capacity at a fraction of the cost of other alternatives: both in the initial cost of the infrastructure/equipment and the annual cost of running the system. Of course, once there is a live installation in Kyoto or one of their other prospective customers, the validity of this system will be authenticated (or not). Offline retailers will increase the velocity of moving towards omnichannel. This forecast discussed both acquisitions of e-commerce companies by offline retailers (with Walmart leading the way) and introducing more online technology in physical stores. Walmart did continue its online buying spree in 2018 with major acquisitions of Art.com, Bare Necessities, Eloquii, Cornershop and Flipkart (the largest at $16 billion). In the case of the acquisitions that are online brands, Walmart intends to introduce these into their physical stores and continue to sell them online. Nordstrom has also moved further to integrate its online and offline business by taking valuable floor space in stores and repurposing it for online buyers to pick up and try on clothes they have purchased online. By placing the location in a very prominent spot, I’m sure Nordstrom is thinking it will help spur more customers to buy online. By having in store locations for picking up and trying on, Nordstrom should reduce returns, lower the cost of shipping, and bring additional customers into their stores (who otherwise might not visit them). Now, about 25% – 30% of shoppers say that social platforms like Pinterest, Instagram, Facebook and Snapchat have influence over their purchases. On June 28, 2018 Snapchat began a program for its influencers to use Social Commerce through a tool that allows users to view a video from the influencer and then to swipe up on a product shown in the video to buy it. In September, The Verge reported that Instagram is developing a new app for social commerce. Pinterest and Facebook have been in the social commerce fray longer and have increasing success. It appears that 2018 was the year the social commerce wars accelerated. “The Empire Strikes Back”: automobile manufacturers will begin to take steps to reclaim use of its GPS. Carmakers face a serious problem regarding their built-in navigation systems. Consumers are forced to pay hundreds of dollars for them and then use free apps on their phones like Waze or Google maps instead. This does not endear them to consumers. The problem is that carmakers are not great at software design but have been reluctant to use third party providers for their GPS and entertainment. Now, the Renault-Nissan-Mitsubishi Alliance has agreed to design Google’s Android OS, including Google navigation, into their next generation cars expected starting in 2021. This is a win for users as that will provide a competent GPS that utilizes the existing screen in cars as opposed to having to rely on your phone app for navigation. In another win for consumers, Amazon and Telenav (a connected car and location based services provider) announced a significant partnership today, January 7, 2019. As part of it, Amazon’s voice assistant will now be part of Telenavs in-car navigation systems. With this included, Telenav’s next generation system will enable its customers, like General Motors, to provide a “smart assistant” thereby making the system included with cars the one to use rather than one’s phone apps. Stay tuned for my top ten predictions for 2019…but remember that I have already said the 4 stocks recommended for 2018 will remain on the list. In working with early stage businesses, I often get the question as to what metrics should management and the board use to help understand a company’s progress. It is important for every company to establish a set of consistent KPIs that are used to objectively track progress. While these need to be a part of each board package, it is even more important for the executive team to utilize this for managing their company. While this post focuses on SaaS/Subscription companies, the majority of it applies to most other types of businesses. Many companies will also need KPIs regarding inventory in addition to the ones above. While there may be very complex analysis behind some of these numbers, it’s important to try to keep KPIs to 2-5 pages of a board package. Use of the right KPIs will give a solid, objective, consistent top-down view of the company’s progress. The P&L portion of the package is obviously critical, but I have a possibly unique view on how this should be included in the body of a board package. One mistake many companies make is confusing detail with better analysis. I often see models that have 50-100 line items for expenses and show this by month for 3 or more years out… but show one or no years of history. What this does is waste a great deal of time on predicting things that are inconsequential and controllable (by month), while eliminating all perspective. Things like seasonality are lost if one is unable to view 3 years of revenue at a time without scrolling from page to page. Of course, for the current year’s budget it is appropriate for management to establish monthly expectations in detail, but for any long-term planning, success revolves around revenue, gross margins, marketing/sales spend and the number of employees. For some companies that are deep technology players there may be significant costs in R&D other than payroll, but this is the exception. By using a simple formula for G&A based on the number of employees, the board can apply a sanity check on whether cost estimates in the long-term model will be on target assuming revenue is on target. So why spend excessive time on nits? Aggregating cost frees up time for better understanding how and why revenue will ramp, the relationship between revenue types and gross margin, the cost of acquiring a customer, the lifetime value of a customer and the average spend per employee. A second version of the P&L should be produced for budget comparison purposes. It should have the same rows but have the columns be current period actual, current period budget, year to date (YTD) actual, year to date budget, current full year forecast, budget for the full year. The detailed method of calculating LTR does not need to be shown in every board package but should be included at least once per year, but calculated monthly for management. The LTR calculation uses a grid where the columns would be the various Quarterly cohorts, that is all customers that first purchased that quarter (management might also do this using monthly instead of quarterly). This analysis can be applied to non-SaaS companies as well as SaaS entities. The first row would be the number of customers in the cohort. The next row would be the first month’s revenue for the cohort, the next the second months revenue, and so on until reaching 36 months (or whatever number the board prefers for B2B…I prefer 60 months). The next row would be the total for the full period and the final row would be the average Lifetime Revenue, LTR, per member of the cohort. 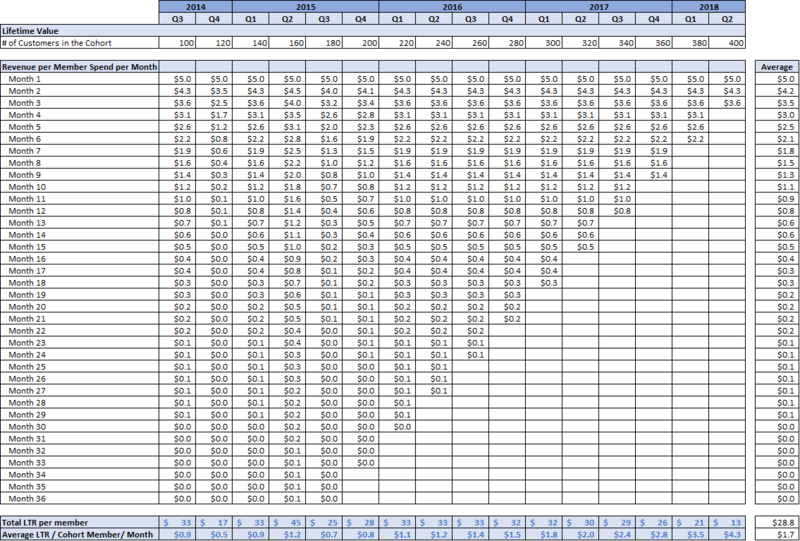 A second table would replicate the grid but show average per member of the cohort for each month (row). That table allows comparisons of cohorts to see if the average revenue of a newer cohort is getting better or worse than older ones for month 2 or month 6 or month 36, etc. Cohorts that have a full 36 months of data need to be at least 36 months old. What this means is that more recent cohorts will not have a full set of information but still can be used to see what trends have occurred. For example, is the second months average revenue for a current cohort much less than it was for a cohort one year ago? While newer cohorts do not have full sets of monthly revenue data, they still are very relevant in calculating more recent LTR. This can be done by using average monthly declines in sequential months and applying them to cohorts with fewer months of data. Calculating CAC is done in a variety of ways and is quite different for customers acquired electronically versus those obtained by a sales force. Many companies I’ve seen have a combination of the two. CAC = MCTC / the percent that converts from the promotional trial to a paying customer. For many eCommerce companies and B2B companies that sell electronically, marketing is the primary cost involved in acquiring a paying customer. For those utilizing a sales force, the marketing expense plus the sales expense must be accumulated to determine CAC. There are many nuances ignored in the simple method shown. For example, some leads may take many months to close. Some may go through a pilot before closing. Therefore, there are more sophisticated methods of calculating CAC but using this method would begin the process of understanding an important indicator of efficiency of customer acquisition. When forecasting gross margin, it is important to be cautious in predicting some of these savings. The board should question radical changes in GM in the forecast. Certain efficiencies should be seen in a quarterly trend, and a marked improvement from the trend needs to be justified. The more significant jump in GM from a second DC can be calculated by looking at the change in shipping rates for customers that will be serviced from the new DC vs what rates are for these customers from the existing one. The calculation of VP% should be based on current numbers as they will apply going forward. Determining a company’s marketing efficiency requires comparing LTV to the cost of customer acquisition. As mentioned earlier in the post, if the CAC is too large a proportion of LTV, a company may be showing deceptive (profitless) growth. So, the next set of KPIs address marketing efficiency. Early on this number will be negative as there aren’t enough older customers to cover the investment in new ones. But eventually the contribution margin in a month needs to turn positive. To reach profitability it needs to exceed all other costs of the business (G&A, R&D, etc.). By reducing a month’s marketing cost, a company can improve contribution margin that month at the expense of sequential growth… which is why this is a balancing act. I realize this post is long but wanted to include a substantial portion of KPIs in one post. However, I’ll leave more detailed measurement of sales force productivity and deeper analysis of several of the KPIs discussed here for one or more future posts. I’ll begin by apologizing for a midyear brag, but I always tell others to enjoy success and therefore am about to do that myself. In my top ten predictions for 2018 I included a market prediction and 4 stock predictions. I was feeling pretty good that they were all working well when I started to create this post. However, the stock prices for high growth stocks can experience serious shifts in very short periods. Facebook and Tesla both had (what I consider) minor shortfalls against expectations in the 10 days since and have subsequently declined quite a bit in that period. But given the strength of my other two recommendations, Amazon and Stitchfix, the four still have an average gain of 15% as of July 27. Since I’ve only felt comfortable predicting the market when it was easy (after 9/11 and after the 2008 mortgage blowup), I was nervous about predicting the S&P would be up this year as it was a closer call and was somewhat controversial given the length of the bull market prior to this year. But it seemed obvious that the new tax law would be very positive for corporate earnings. So, I thought the S&P would be up despite the likelihood of rising interest rates. So far, it is ahead 4.4% year to date driven by stronger earnings. Since I always fear that my record of annual wins can’t continue I wanted to take a midyear victory lap just in case everything collapses in the second half of the year (which I don’t expect but always fear). So I continue to hold all 4 stocks and in fact bought a bit more Facebook today. In my recap of 2017 predictions I pointed out how boring my stock predictions have been with Tesla and Facebook on my list every year since 2013 and Amazon on for two of the past three years. But what I learned on Wall Street is that sticking with companies that have strong competitive advantages in a potentially mega-sized market can create great performance over time (assuming one is correct)! So here we go again, because as stated in my January 5 post, I am again including Tesla, Facebook and Amazon in my Top ten list for 2018. I believe they each continue to offer strong upside, as explained below. I’m also adding a younger company, with a modest market cap, thus more potential upside coupled with more risk. The company is Stitch Fix, an early leader in providing women with the ability to shop for fashion-forward clothes at home. My belief in the four companies is backed up by my having an equity position in each of them. I’m expecting the four stocks to outperform the market. So, in a steeply declining market, out-performance might occur with the stock itself being down (but less than the market). Having mentioned the possibility of a down market, I’m predicting the market will rise this year. This is a bit scary for me, as predicting the market as a whole is not my specialty. We’ll start with the stock picks (with January 2 opening prices of stocks shown in parenthesis) and then move on to the remainder of my 10 predictions. 1. Tesla stock appreciation will continue to outpace the market (it opened the year at $312/share). The good news and bad news on Tesla is the delays in production of the Model 3. The good part is that we can still look forward to massive increases in the number of cars the company sells once Tesla gets production ramping (I estimate the Model 3 backlog is well in excess of 500,000 units going into 2018 and demand appears to be growing). In 2017, Tesla shipped between 80,000 and 100,000 vehicles with revenue up 30% in Q3 without help from the model 3. If the company is successful at ramping capacity (and acquiring needed parts), it expects to reach a production rate of 5,000 cars per week by the end of Q1 and 10,000 by the end of the year. That could mean that the number of units produced in Q4 2018 will be more than four times that sold in Q4 2017 (with revenue about 2.0-2.5x due to the Model 3 being a lower priced car). Additionally, while it is modest compared to revenue from selling autos, the company appears to be the leader in battery production. It recently announced the largest battery deal ever, a $50 million contract (now completed on time) to supply what is essentially a massive backup battery complex for energy to Southern Australia. While this type of project is unlikely to be a major portion of revenue in the near term, it can add to Tesla’s growth rate and profitability. 2. Facebook stock appreciation will continue to outpace the market (it opened the year at $182/share). The core Facebook user base growth has slowed considerably but Facebook has a product portfolio that includes Instagram, WhatsApp and Oculus. This gives Facebook multiple opportunities for revenue growth: Improve the revenue per DAU (daily active user) on Facebook itself; increase efforts to monetize Instagram and WhatsApp in more meaningful ways; and build the install base of Oculus. Facebook advertising rates have been increasing steadily as more mainstream companies shift budget from traditional advertising to Facebook, especially in view of declining TV viewership coupled with increased use of DVRs (allowing viewers to skip ads). Higher advertising rates, combined with modest growth in DAUs, should lead to continued strong revenue growth. And while the Oculus product did not get out of the gate as fast as expected, it began picking up steam in Q3 2017 after Facebook reduced prices. At 210,000 units for the quarter it may have contributed up to 5% of Q3 revenue. The wild card here is if a “killer app” (a software application that becomes a must have) launches that is only available on the Oculus, sales of Oculus could jump substantially in a short time. 3. Amazon stock appreciation will outpace the market (it opened the year at $1188/share). Amazon, remarkably, increased its revenue growth rate in 2017 as compared to 2016. This is unusual for companies of this size. In 2018, we expect online to continue to pick up share in retail and Amazon to gain more share of online. The acquisition of Whole Foods will add approximately $4B per quarter in revenue, boosting year/year revenue growth of Amazon an additional 9%-11% per quarter, if Whole Foods revenue remains flattish. If Amazon achieves organic growth of 25% (in Q3 it was 29% so that would be a drop) in 2018, this would put the 3 quarters starting in Q4 2017 at about 35% growth. While we do expect Amazon to boost Whole Foods revenue, that is not required to reach those levels. In Q4 2018, reported revenue will return to organic growth levels. The Amazon story also features two other important growth drivers. First, I expect the Echo to have another substantial growth year and continue to emerge as a new platform in the home. Additionally, Amazon appears poised to benefit from continued business migration to the cloud coupled with increased market share and higher average revenue per cloud customer. This will be driven by modest price increases and introduction of more services as part of its cloud offering. The success of the Amazon Echo with industry leading voice technology should continue to provide another boost to Amazon’s revenue. Additionally, having a large footprint of physical stores will allow Amazon to increase distribution of many products. 4. Stitch Fix stock appreciation will outpace the market (it opened the year at $25/share and is at the same level as I write this post). Stitch Fix is my riskiest stock forecast. As a new public company, it has yet to establish a track record of performance that one can depend upon. On the other hand, it’s the early leader in a massive market that will increasingly move online, at-home shopping for fashion forward clothes. The number of people who prefer shopping at home to going to a physical store is on the increase. The type of goods they wish to buy expands every year. Now, clothing is becoming a new category on the rapid rise (it grew from 11% of overall clothing retail sales in 2011 to 19% in 2016). It is important for women buying this way to feel that the provider understands what they want and facilitates making it easy to obtain clothes they prefer. Stitch Fix uses substantial data analysis to personalize each box it sends a customer. The woman can try them on, keep (and pay for) those they like, and return the rest very easily. 5. The stock market will rise in 2018 (the S&P opened the year at 2,696 on January 2). The degree to which any specific company’s pre-tax earnings mix changes between the United States and other countries is unpredictable to me, so I’m providing a table showing the impact on after-tax earnings growth for theoretical companies instead. 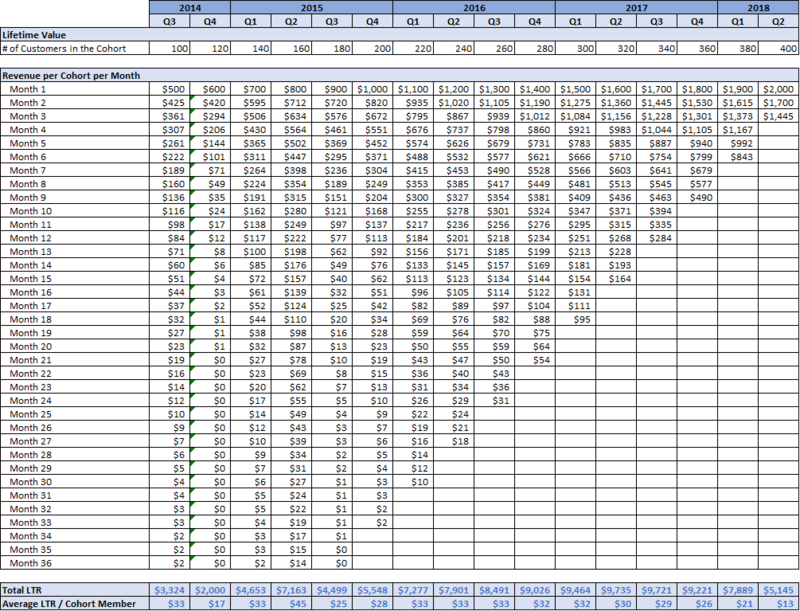 Table 2 shows the impact of lowering the U.S. corporate from 35% to 21% on four example companies. To provide context, I show two companies growing pre-tax earnings by 10% and two companies by 30%. If blended tax rates didn’t change, EPS would grow by the same amount as pre-tax earnings. For Companies 1 and 3, Table 2 shows what the increase in earnings would be if their blended 2017 tax rate was 35% and 2018 shifts to 21%. 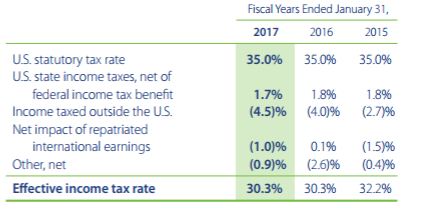 For companies 2 and 4, Table 2 shows what the increase in earnings would be if the 2017 rate was 30% (Walmart’s blended rate the past three years) and the 2018 blended rate is 20%. As you can see, companies that have the majority of 2018 pre-tax earnings subject to the full U.S. tax rate could experience EPS growth 15%-30% above their pre-tax earnings growth. On the other hand, if a company has a minimal amount of earnings in the U.S. (like the 5% of earnings Microsoft had in fiscal 2017), the benefit will be minimal. Whatever benefits do accrue will also boost cash, leading to potential investments that could help future earnings. If companies that have maximum benefits from this have no decline in their P/E ratio, this would mean a substantial increase in their share price, thus the forecast of an up market. But as I learned on Wall Street, it’s important to sight risk. The biggest risks to this forecast are the expected rise in interest rates this year (which usually is negative for the market) and the fact that the market is already at all-time highs. 6. Battles between the federal government and states will continue over marijuana use but the cannabis industry will emerge as one to invest in. The battle over legalization of Marijuana reached a turning point in 2017 as polls showed that over 60% of Americans now favor full legalization (as compared to 12% in 1969). Prior to 2000, only three states (California, Oregon and Maine) had made medical cannabis legal. Now 29 states have made it legal for medical use and six have legalized sale for recreational use. Given the swing in voter sentiment (and a need for additional sources of tax revenue), more states are moving towards legalization for recreational and medical purposes. This has put the “legal” marijuana industry on a torrid growth curve. In Colorado, one of the first states to broadly legalize use, revenue is over $1 billion per year and overall 2017 industry revenue is estimated at nearly $8 billion, up 20% year/year. Given expected legalization by more states and the ability to market product openly once it is legal, New Frontier Data predicts that industry revenue will more than triple by 2025. The industry is making a strong case that medical use has compelling results for a wide variety of illnesses and high margin, medical use is forecast to generate over 50% of the 2025 revenue. Given this backdrop, public cannabis companies have had very strong performance. Despite this, in 2016, VCs only invested about $49 million in the sector. We expect that number to escalate dramatically in 2017 through 2019. While public cannabis stocks are trading at nosebleed valuations, they could have continued strong performance as market share consolidates and more states (and Canada) head towards legalization. One caveat to this is that Federal law still makes marijuana use illegal and the Trump administration is adopting a more aggressive policy towards pursuing producers, even in states that have made use legal. The states that have legalized marijuana use are gearing up to battle the federal government. Traffic congestion in cities continues to worsen. Our post on December 14, 2017 discussed a new approach to urban transportation, utilizing small footprint automated cars (one to two passengers, no trunk, no driver) in a dedicated corridor. This appears much more cost effective than a Rapid Bus Transit solution and far more affordable than new subway lines. As discussed in that post, Uber and other ride services increase traffic and don’t appear to be a solution. The thought that automating these vehicles will relieve pressure is overly optimistic. I expect at least one city to commit to testing the method discussed in the December post before the end of this year – it is unlikely to be a U.S. city. The approach outlined in that post is one of several that is likely to be tried over the coming years as new thinking is clearly needed to prevent the traffic congestion that makes cities less livable. 8. Offline retailers will increase the velocity of moving towards omnichannel. An increased pace of acquisition of e-commerce companies, technologies and brands with Walmart leading the way. Walmart and others need to participate more heavily in online as their core offline business continues to lose share to online. In 2017, Walmart made several large acquisitions and has emerged as the leader among large retailers in moving online. This, in turn, has helped its stock performance. After a stellar 12 months in which the stock was up over 40%, it finally exceeded its January 2015 high of $89 per share (it reached $101/share as we are finalizing the post). I expect Walmart and others in physical retail to make acquisitions that are meaningful in 2018 so as to speed up the transformation of their businesses to an omnichannel approach. Collaborating to introduce more online/technology into their physical stores (which Amazon is likely to do in Whole Foods stores). This can take the form of screens in the stores to order online (a la William Sonoma), having online purchases shipped to your local store (already done by Nordstrom) and adding substantial ability to use technology to create personalized items right at the store, which would subsequently be produced and shipped by a partner. 9. Social commerce will begin to emerge as a new category. I expect to see existing e-commerce players adding more elements of social, existing social players improving their approach to commerce and a rising trend of emerging companies focused on fully integrated social commerce. 10. “The Empire Strikes Back”: automobile manufacturers will begin to take steps to reclaim use of its GPS. 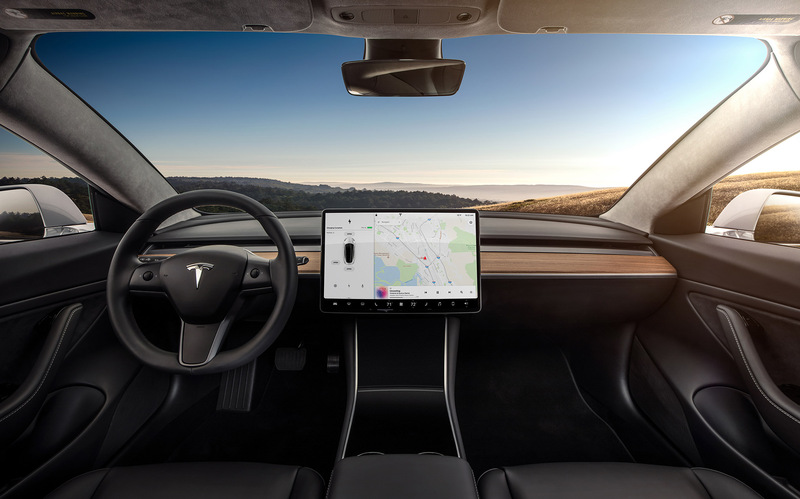 It is almost shameful that automobile manufacturers, other than Tesla, have lost substantial usage of their onboard GPS systems as many people use their cell phones or a small device to run Google, Waze (owned by Google) or Garmin instead of the larger screen in their car. In the hundreds of times I’ve taken an Uber or Lyft, I’ve never seen the driver use their car’s system. To modernize their existing systems, manufacturers may need to license software from a third party. Several companies are offering next generation products that claim to replicate the optimization offered by Waze but also add new features that go beyond it like offering to order coffee and other items to enable the driver to stop at a nearby location and have the product prepaid and waiting for them. In addition to adding value to the user, this also leads to a lead-gen revenue opportunity. In 2018, I expect one or more auto manufacturers to commit to including a third-party product in one or more of their models. Tesla model 3 sample car generates huge buzz at Stanford Mall in Menlo Park California. This past weekend my wife and I experienced something we had not seen before – a substantial line of people waiting to check out a car, one of the first Model 3 cars seen live. We were walking through the Stanford Mall where Tesla has a “Guide Store” and came upon a line of about 60 people willing to wait a few hours to get to check out one of the two Model 3’s available for perusal in California (the other was in L.A.). An hour later we came back, and the line had grown to 80 people. To be clear, the car was not available for a test drive, only for seeing it, sitting in it, finding out more info, etc. Given the buzz involved, it seems to me that as other locations are given Model 3 cars to look at, the number of people ordering a Model 3 each week might increase faster than Tesla’s capacity to fulfill. Be advised that my top ten for 2018 will continue to include all three picks from 2017. I’m quite pleased that I continue to be fortunate, as the three were up an average of 53% in 2017. Furthermore, each of my top ten forecasts proved pretty accurate, as well! I’ve listed in bold the 2017 stock picks and trend forecasts below, and give a personal evaluation of how I fared on each. For context, the S&P was up 19% and the Nasdaq 28% in 2017. Tesla stock appreciation will continue to outpace the market. Tesla, once again, posted very strong performance. While the Model 3 experienced considerable delays, backorders for it continued to climb as ratings were very strong. As of mid-August, Tesla was adding a net of 1,800 orders per day and I believe it probably closed the year at over a 500,000-unit backlog. So, while the stock tailed off a bit from its high ($385 in September), it was up 45% from January 3, 2017 to January 2, 2018 and ended the year at 7 times the original price I paid in 2013 when I started recommending it. Its competitors are working hard to catch up, but they are still trailing by quite a bit. Facebook stock appreciation will continue to outpace the market. Facebook stock appreciated 57% year/year and opened on January 2, 2018 at $182 (nearly 8 times my original price paid in 2013 when I started recommending it). This was on the heels of 47% revenue growth (through 3 quarters) and even higher earnings growth. Amazon stock appreciation will outpace the market. Amazon stock appreciated 57% in 2017 and opened on January 2, 2018 at $1,188 per share. It had been on my recommended list in 2015 when it appreciated 137%. Taking it off in 2016 was based on Amazon’s stock price getting a bit ahead of itself (and revenue did catch up that year growing 25% while the stock was only up about 12%). In 2017, the company increased its growth rate (even before the acquisition of Whole Foods) and appeared to consolidate its ability to dominate online retail. Both online and offline retailers will increasingly use an omnichannel approach. Traditional retailers started accelerating the pace at which they attempted to blend online and offline in 2017. Walmart led, finally realizing it had to step up its game to compete with Amazon. While its biggest acquisition was Jet.com for over $3 billion, it also acquired Bonobos, Modcloth.com, Moosejaw, Shoebuy.com and Hayneedle.com, creating a portfolio of online brands that could also be sold offline. Target focused on becoming a leader in one-day delivery by acquiring Shipt and Grand Junction, two leaders in home delivery. While I had not predicted anything as large as a Whole Foods acquisition for Amazon, I did forecast that they would increase their footprint of physical locations (see October 2016 Soundbytes). The strategy for online brands to open “Guide” brick and mortar stores ( e.g. Tesla, Warby Parker, Everlane, etc.) continued at a rapid pace. A giant piloted robot will be demo’d as the next form of entertainment. As expected, Azure portfolio company, Megabots, delivered on this forecast by staging an international fight with a giant robot from Japan. The fight was not live as the robots are still “temperamental” (meaning they occasionally stop working during combat). However, interest in this new form of entertainment was incredible as the video of the fight garnered over 5 million views (which is in the range of an average prime-time TV show). There is still a large amount of work to be done to convert this to an ongoing form of entertainment, but all the ingredients are there. 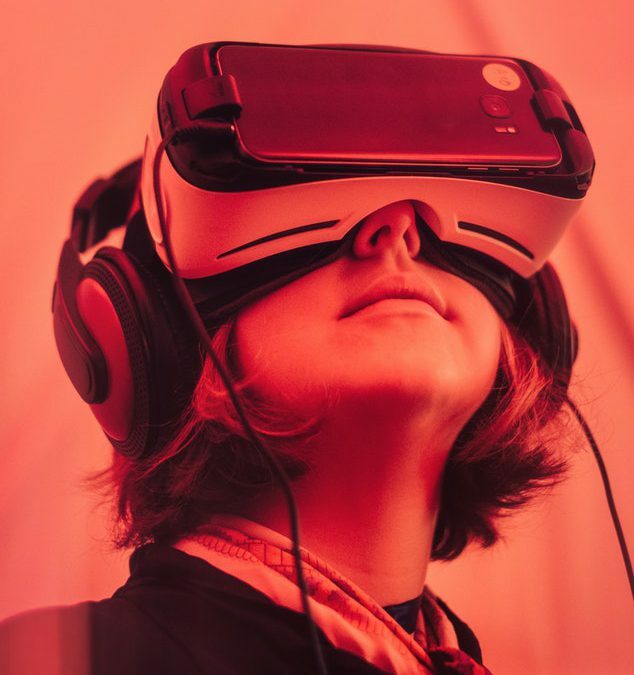 Virtual and Augmented reality products will escalate. Sales of VR/AR headsets appear to have well exceeded 10 million units for the year with some market gain for higher-end products. The types of applications have expanded from gaming to room design (and viewing), travel, inventory management, education, healthcare, entertainment and more. While the actual growth in unit sales fell short of what many expected, it still was substantial. With Apple’s acquisition of Vrvana (augmented reality headset maker) it seems clear that Apple plans to launch multiple products in the category over the next 2-3 years, and with Facebook’s launch of ArKIT, it’s social AR development platform, there is clearly a lot of focus and growth ahead. Magic Leap will disappoint in 2017. Magic Leap, after 5 years of development and $1.5 billion of investment, did not launch a product in 2017. But, in late December they announced that their first product will launch in 2018. Once again, the company has made strong claims for what its product will do, and some have said early adopters (at a very hefty price likely to be in the $1,500 range) are said to be like those who bought the first iPod. So, while it disappointed in 2017, it is difficult to tell whether or not this will eventually be a winning company as it’s hard to separate hype from reality. Cable companies will see a slide in adoption. According to eMarketer, “cord cutting”, i.e. getting rid of cable, reached record proportions in 2017, well exceeding their prior forecast. Just as worrisome to providers, the average time watching TV dropped as well, implying decreased dependence on traditional consumption. Given the increase now evident in cord cutting, UBS (as I did a year ago) is now forecasting substantial acceleration of the decline in subscribers. While the number of subscribers bounced around a bit between 2011 and 2015, when all was said and done, the aggregate drop in that four-year period was less than 0.02%. UBS now forecasts that between the end of 2016 and the end of 2018 the drop will be 7.3%. The more the industry tries to offset the drop by price increases, the more they will accelerate the pace of cord cutting. Spotify will either postpone its IPO or have a disappointing one. When we made this forecast, Spotify was expected to go public in Q2 2017. Spotify postponed its IPO into 2018 while working on new contracts with the major music labels to try to improve its business model. It was successful in these negotiations in that the labels all agreed to new terms. Since the terms were not announced, we’ll need to see financials for Q1 2018 to better understand the magnitude of improvement. In the first half of the year, Spotify reported that gross margins improved from 16% to 22%, but this merely cut its loss level rather than move the company to profitability. It has stated that it expects to do a non-traditional IPO (a direct listing without using an investment bank) in the first half of 2018. If the valuation approaches its last private round, I would caution investors to stay away, as that valuation, coupled with 22% gross margins (and over 12% of revenue in sales and marketing cost to acquire customers), implies net margin in the mid-single digits at best (assuming they can reduce R&D and G&A as a percent of revenue). This becomes much more challenging in the face of a $1.6 billion lawsuit filed against it for illegally offering songs without compensating the music publisher. Even if they managed to successfully fight the lawsuit and improve margin, Spotify would be valued at close to 100 times “potential earnings” and these earnings may not even materialize. Amazon’s Echo will gain considerable traction in 2017. Sales of the Echo exploded in 2017 with Amazon announcing that it “sold 10s of millions of Alexa-enabled devices” exceeding our aggressive forecast of 2-3x the 4.4 million units sold in 2016. The Alexa app was also the top app for both Android and iOS phones. It clearly has carved out a niche as a new major platform. Stay tuned for my top 10 predictions of 2018! In our December 20, 2017 post, I discussed just how much Steph Curry improves teammate performance and how effective a shooter he is. I also mentioned that Russell Westbrook leading the league in scoring in the prior season might have been detrimental to his team as his shooting percentage falls well below the league average. Now, in his first game returning to the lineup, Curry had an effective shooting percentage that exceeded 100% while scoring 38 points (this means scoring more than 2 points for every shot taken). It would be interesting to know if Curry is the first player ever to score over 35 points with an effective shooting percentage above 100%! Also, as of now, the Warriors are scoring over 15 points more per game this season with Curry in the lineup than they did for the 11 games he was out (which directly ties to the 7.4% improvement in field goal percentage that his teammates achieve when playing with Curry as discussed in the post).